Some mornings when I am having my quiet time, I think it’s going to be a gentle, quiet time of reading and prayer. Sometimes I even think it might be somewhat benign. (I know, sounds awful, doesn’t it!) But then I read a verse—and ZING! God shows me something in my life that needs attention. I have a choice. Am I going to obey? Or am I going to keep reading and move on with my day? Later, I read a different passage or verse—and ZING! That same issue. I may have yielded that issue in my head. Yes, God. I know you want me to stop doing this particular thing, or get rid of that destructive habit. Not really taking it to heart. Not really changing. But God is loving and faithful. He wants to make sure we get His message. To know when He’s really speaking. So He zings us again with truth. Maybe I really did give this issue over to God, but it’s been painful to keep saying no. Again God gives a Word in Scripture to confirm that decision. Yes, Father. I will continue to obey You in this. Thank You for encouraging and strengthening my heart so I can keep doing what You want me to do. 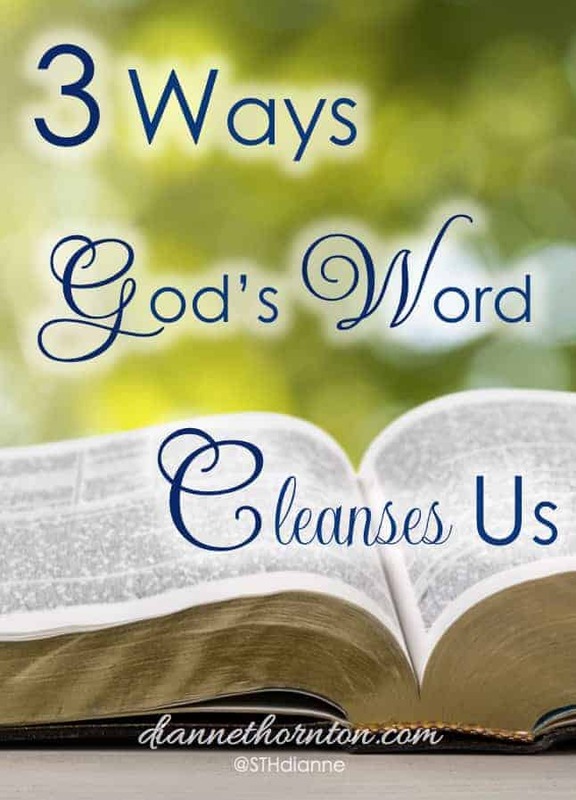 This is the cleansing process of God’s Word. God’s desire is for us to be conformed to the image of His Son (Romans 8:29). And the way that happens is by spending time in the Bible. A lot of it. Transformation doesn’t happen overnight. It’s a long process. God gently guides us through His Word and prepares our hearts to hear His message. When we yield, we take steps in becoming the person God wants us to be (2 Corinthians 3:18). The Bible is rich with truth. Unlike any other book, we can read a verse or passage repeatedly and gain new insight each time. 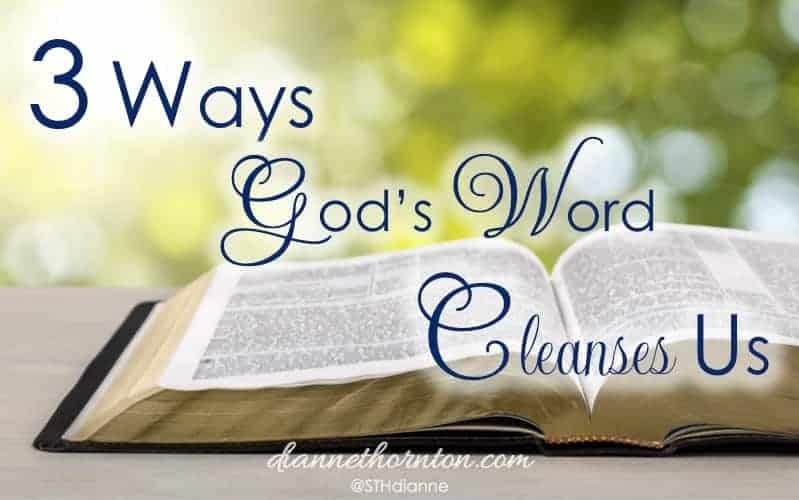 As we delight in His Word and meditate on His truth, God’s Word cleanses us. 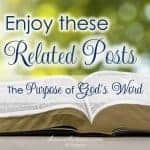 First, God’s Word helps us understand our true thoughts and attitudes. The Book of Hebrews tells us that God’s Word is alive and active. Second, God’s Word reflects our obedience or disobedience. Third, God’s Word sets us free. As parents, we discipline our children. We correct them. When our kids move into the teenage years, (usually) they resist correction more. Because we love them, we keep at it. We know what’s ahead. We know the pitfalls they will fall into if they don’t listen and learn. Our goal is for them to become responsible, independent adults. In essence, we want them to live in freedom. It’s the same with God’s Word. This is what He wants for us! He doesn’t want us trapped by sin and all entanglements that go with it. God’s Word cleanses us so we can be free! The next time I sit with God’s Word and He ZINGS me with a verse exposing my sin, I want my first thought to be–Christ died so I could be free. That changes everything! 1Zane C. Hodges, “Hebrews,” in The Bible Knowledge Commentary: An Exposition of the Scriptures, ed. J. F. Walvoord and R. B. Zuck, vol. 2 (Wheaton, IL: Victor Books, 1985), 789–790. If only we’d always remember that man does not live by bread alone but by the Word of God! God help us; because we really do need His Word to live . Isn’t it amazing how God works through His words? I often get those zing moments too, Dianne. I’m grateful for the cleansing that comes! 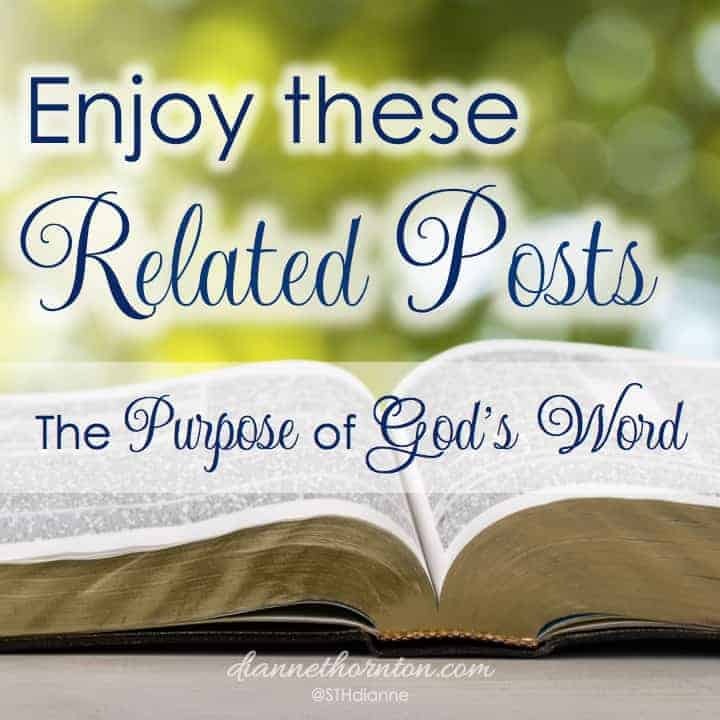 Great post Diane, we could all use a few zingers. Love everything written in this blog.. yes and Amen to those zing moments..